Disney World offers support to some of their guests with disabilities or special needs in the form of the DAS, or Disability Access Service. What does a DAS do for you? The DAS allows you to wait for a ride or attraction outside of the queue for most of the wait. While you will still need to wait about the same amount of time that you would have if you waited in the regular Standby queue, you can wait anywhere that you’re comfortable. You can even go on another ride or attraction if you have time. This is great for those who have difficulty staying inside a queue. The DAS can be used on rides, attractions and character meet & greets that offer both a Fastpass+ queue and a regular Standby queue. What does a DAS NOT do for you? – A DAS does not get you shorter wait times for attractions and rides. It does not get you to the front of the line. – A DAS does not Provide a place to sit inside the attractions/queues. – A DAS does not tell Cast Members what other assistance you might need such as sitting up close, avoiding stairs, etc. You will need to explain your needs to the Cast Member at the attractions. A DAS is NOT required for those accommodations. – A DAS is not usable on rides, attractions, meet & greets, parades and fireworks shows that don’t offer both a Standby queue and a Fastpass+ queue. A DAS is NOT used at the water parks, for buses or at restaurants. Who is a DAS NOT meant for? For those with mobility problems, if your issue can be solved by getting a wheelchair or mobility scooter, Disney will not give you a DAS. 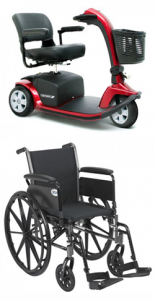 You will need to have a wheelchair, ECV or another mobility device if you have difficulty standing or walking in lines. Keep in mind that most guests walk at least 5 miles per day at Disney, and many queues are over 1/4 to 1/2 mile long. A DAS is NOT required to use mobility devices in lines or on attractions. Those using ECVs, wheelchairs and other mobility devices will usually wait in the regular Standby line (or Fastpass line if they have a Fastpass for that attraction). For a few attractions those guests will be given a Return Time ticket because the entrance and/or line is not accessible. A DAS is not required to get a return time. Who CAN get a DAS? Anyone other than those mentioned above with a disability that makes waiting in a traditional line difficult. To qualify you can have a visible or invisible disability. If you do use a wheelchair or ECV but you have other disabilities that are not mobility related and make it difficult to wait in a traditional line, you still may be able to get a DAS. Where do you go to get a DAS? Before you enter the park, just outside the park entrance, on the left hand side. Just after you enter the park, to the left. Outside the park, there’s a window just before the park entrance on the right side. Inside the park, in the City Hall lobby, to the left of the park entrance. Outside the park, there’s a window just outside the park entrance, on the left. Inside the park, near the park entrance, in the Guest Relations lobby near the turnstiles on the far left. Outside the front of the park to the far right of the main entrance. Near Spaceship Earth on the left side after entering the park. Outside the park , at the entrance to the International Gateway – World Showcase entrance. You can not get a DAS before your visit. It must be done during your visit, when your tickets are active and inside one of the four main parks. You can not get a DAS at Disney Springs. Only in any one of the four main parks. How do you get a DAS? At Guest Relations, you’ll speak with a Cast Member to request a DAS. The person needing the DAS must be there, but they are not required to make the request. Someone in your party such as a guardian can make the request. You’ll be asked why you need it. You do not need proof of your disability. You will not need to give a diagnosis, and doctor’s notes will not be looked at because of legal issues. All the Cast Member will want to know is why a DAS will help. Be prepared to briefly discuss your concerns with the Cast Member. When I’m in line waiting I experience ….. Waiting outside the line helps me because …..
Again, a mobility problem will not qualify you for a DAS if a wheelchair or scooter could solve your problem and make you comfortable. We have heard of people getting a DAS for a mobility problem, but that’s the exception rather than the rule. Once you’re approved, the Cast Member will take your photo and put you in the system. If for any reason you don’t want a photo of your child taken, you can have another person in the party have their photo taken. If you do this, that person will need to be present whenever the DAS is used. How long will the DAS be valid for at Disney World? The DAS will be good for use in all four parks. It will last up to 14 days depending upon your tickets, except for Annual Passholder’s who will have the DAS for 60 days. How many people can I have attached to my DAS? You can have up to 6 people added to your account. That includes the person needing the DAS plus 5 more. If you have more than that in your party, speak with Guest Relations. They may be able to accommodate you. This usually requires a supervisor to get involved. If you have more than 6 people attached to your DAS, be aware that some attractions won’t be able to accommodate that larger number. Everyone in your party will need to be present when you get your DAS so they can be put in the system as a part of your party. This will enable them to join you on the rides and attractions. If someone joins you later, you’ll need to take them to Guest Relations to be added to your DAS. What if more than one person in your party needs a DAS? Each person that needs a DAS can have one. The others in your party can be linked to each DAS holder. There’s no limit to how many DAS holders they can be linked to. This way the non-DAS using members of your party can go on rides and attractions with any of the DAS holders. However a person with a DAS can not be linked to another person with a DAS. Also a person linked to a DAS holder can only be included in one return time at a time. How do you use your DAS at Disney World? 1. Get a return time. After you’ve registered at Guest Relations, the Cast Member who authorized your DAS may offer to give you your first Return Time. After that, you or someone in your party who is connected to your DAS will go to the ride or attraction you’re interested in experiencing next. The person with the disability doesn’t need to be present. It can be anyone connected with the DAS. Tell the Cast Member at the entrance of the attraction/ride that you need a DAS return time. The Cast Member will give you a return time based on the current Standby Wait Time for that attraction. If the return time is very long, your DAS return time will reflect that. Remember you can only have one DAS return time at a time, so this will tie it up the DAS. If there’s more than one person in your party with a DAS and you both want to go on the same ride, you’ll both need to get a Return Time. Or if each DAS holder wants to go on different attractions, they can. However the members of your party must only be listed in one return time at a time. How does the Cast Member come up with a return time exactly? It should be comparable to the amount of time you’d wait if you were waiting in the regular Standby queue. The Cast Member looks at the current wait time for that ride and then at their discretion, they can subtract 10-15 minutes. So if you were waiting in the regular queue and the current wait time would be around 1 hour, your return time might be anywhere from 45 minutes to 1 hour later. Your return time represents the earliest you can get in, but it’s good any time from the return time forward, until the park closes. 2. Wait for your return time. What you do with your time is up to you. Rather than waiting the entire time in a queue, you can wait wherever you want. You can grab a bite to eat, go on another ride, explore the stores, or just people watch! You can even use a Fastpass. 3. Go back to the ride/attraction. You’ll return to the ride after your return time arrives. If an attraction has a Fastpass queue, you’ll be able to use it. If there’s an alternative entrance for those who are handicapped, you should be able to use that. The DAS holder will have their Magic Band or park ticket scanned first. Then the others in the party connected to the DAS can go in. Often you’ll still have to wait in a queue once you go back, but it will be a much shorter wait than if you were in the regular Standby queue. It’s usually no more than 15 minutes, but that’s not set in stone. It can be shorter or longer. The DAS cardholder has to be going on the ride. This means that the party associated with the DAS holder can not use the DAS without the DAS holder being there. 4. Get a new return time. After you have used the DAS Return Time you can get another Return Time for the same attraction you just went on, or you can get one for a different attraction. How many DAS return times can I have at once? You can only have one at a time, and it’s good until you use it (that same day only). Once you redeem your active return time, you can get another one. There is no limit to how many times in a day you can use the DAS system. What if I change my mind and want a DAS at a different ride or attraction? Go to a Cast Member at the new ride or attraction, and tell them you have a DAS already but you’d like it to be modified. They can do that for you. You can also make use of the Fastpass+ system at the same time that you’re making use of the DAS. This is a great strategy for cutting down on wait times. Take a look at our easy guide to learn everything you need to know about using the Fastpass+ system. Can I use a DAS at special ticketed event parties? Sometimes Disney closes down a park (usually Magic Kingdom) and throws a special ticketed event party, like Mickey’s Very Merry Christmas Party or Mickey’s Not-So-Scary Halloween Party. During these parties, the official policy is that guests can not use a DAS. The idea is that during these parties most attractions have short lines, so the DAS won’t be necessary. They also do not have Fastpass during these events. Usually guests of the special ticketed events are allowed to arrive around 4 PM, hours before the party gets underway. While the park is still open to the regular guests who are there for the day, you’ll be able to get a DAS, and the DAS will be usable until the park closes down for the special ticketed event party. If there is a need, sometimes exceptions can be made depending on the Cast Member and attraction. Also we’ve been getting feedback that some Cast Members have been allowing the DAS to be used during these special ticketed event parties. It wouldn’t hurt to ask for what you need, but there’s no guarantee. What if I need additional accommodations? Be prepared to explain your additional needs briefly to the Cast Member at the individual attraction. 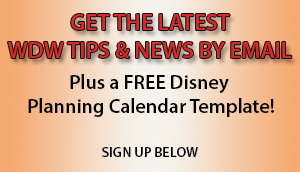 You can view Disney’s DAS page for FAQs here. 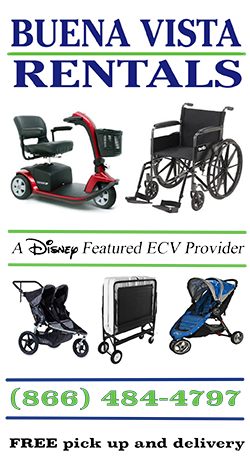 Check out our articles for special needs, disabilities and extra challenges at Disney World. These articles cover everything from pregnancy at Disney World to Diabetes, allergies, etc. NEED TO RENT A SCOOTER or WHEELCHAIR? We recommend Buena Vista Rentals. Our readers get a FREE ACCESSORY with rental. Choose a FREE CUP HOLDER OR CANE HOLDER with scooter rental. MENTION THE DISCOUNT CODE “DIZABLED“.